Yes — I sat in on a Nixie Tube Class. Mike Lensman presented. This class was for members only, I had heard that it was a beta and that Mike was getting the kinks out of it. I thought the class was top notch and full of information. Let me recount some of the things I learned. This is Mike — He looks excited about the subject matter, that made me want to pay attention. This is the High Voltage end. Off to the right the wires go to your normal 120 volt AC outlet. The thing in the lower right hand corner that looks like a switch, that’s not a switch. That is a circuit breaker. That is one of the grand tips I learned. Work with a circuit breaker, the smallest that you can get by with. That way if you do manage to draw a high voltage shot, the circuit breaker may throw and save your life. In the middle of the photo is a transformer. A transformer will electrically isolate the circuit from the Earth. The Earth it seems is part of a normal AC circuit and is called ground. The transformer will isolate that, now the Earth ground will not be the ground in our DC circuit, this makes it harder for us to get a high voltage shock. Now on to the left of the photo. Here we see a bridge rectifier, this takes the AC signal, flips half of it, and with the capacitor shown there, gives a fairly steady DC current. From 120 volts RMS — we can get 160 volts DC. nice. So What is a Nixie Tube? Basically a nixie tube is an “old school LED”. WHAT? Well they were used to give a digital readout in an analog word. Instead of using a meter face, nixie tubes were used to show a value. They are vacuum tubes. You put a high voltage current through them, and they glow. They will glow in the shape of a number from 0 thru 9, depending upon which leads on the tube you run the current through. There is one anode and many cathodes. One cathode for each number. A switch, relay or transistor can be used to complete the circuit. Now at this point in the lecture Mike mentioned that he didn’t have any slide ready to project so he used the white board. 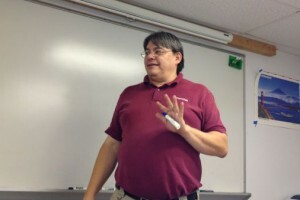 In my expert opinion, the white board was better than any slides he could have prepared. 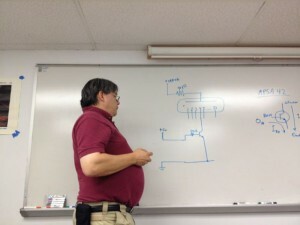 he was able to draw the circuits and explain them as he went. This kept the attention of the class, and also instilled a sense of mastery of the subject. I got the feeling the class could have continued on for hours, down many detailed sidelines. So, the big rounded box in the middle represents the vacuum tube, aka nixie tube. You can see at the top that there is some high voltage coming in. A resistor is used to limit the current. We don’t need much current to make the tube glow. Too much current will light up other numbers in the tube, or will cause a fuzzy appearance or maybe even destroy the tube. So use a current limiting resistor. Now which ever of the “number” is shorted to ground will glow. And t appears that will be the number THREE in the above schematic. Well, we don’t want to have to manually move a wire from each cathode to ground. What would be the point of that? And besides this is high voltage we WOULD get hurt doing that. 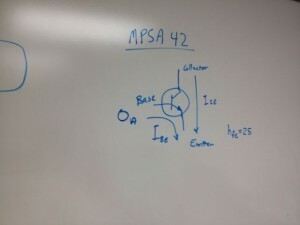 So Mike told us about the MPSA42. This is a transistor that may be used like a switch. We just connect on of these to each of the cathodes to ground. YES we do this working according to our plan, with the electricity disconnected following safety rules. So the collector is connected to the tube, the emitter is connected to ground. And guess what? YEP! Not one of the digits will be on. That is where the base comes into play. 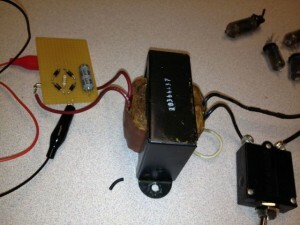 We can connect the base to 5 volts or ground. When it is connected to 5 volts the transistor will “turn on” and high voltage current will flow through the nixie tube and illuminate the numeral that it is attached to. pretty neat. 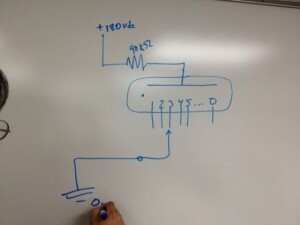 Here the transistor is put into the circuit. So we still have to connect wires for each numeral to light up. Without the transistor we were connecting a high voltage line to ground. With the transistor the high voltage line is always connected, we just need to connect a low 5 voltage line to the transistor to turn on a numeral. Still who wants to do that? Not me. So we can use a Microcontroller to do this for us. 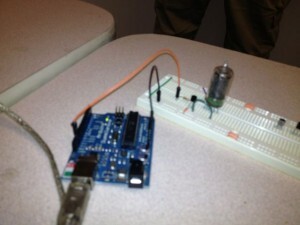 Mike used an Arduino in class. Here we see the blue Arduino board. It has a usb cable leaving out the bottom of the photo. This cable powers the Arduino and pushes the program to be run into the micro controller We see an orange and a black line going from the Arduino to the white bread board. The black is ground. The orange comes from one of the digital output pins on the Arduino. The orange is connected via a current limiting resistor to the base of the transistor. The black is connected to the emitter of the transistor. And finally we get to see an actual nixie tube. Sadly I didn’t get any photos of the tube when the numerals were illuminated. So if you want to see that. Sign up for the class when it is offered again. Thank you for reading about this class. I didn’t intend to “reteach” the class. I wanted to give a quick overview of what you might learn when you take the class. Mike also went into how to multiplex the cathodes so you can get by with fewer transistors. Thanks for blogging about the class – great info, and I can’t wait to take the class! !